Every good movie deserves a great sequel, and so it is with books, too. In his latest offering, Third Real: Conscious Creation Goes Back to the Movies (ISBN 978-1976207501, 2017), award-winning author Brent Marchant builds on the principles explored in his previous two titles, further explaining how the world of film helps to illustrate the process behind the world we create. As in his earlier works, Marchant draws upon his signature approach of using film critiques to show how movies reflect the principles of “conscious creation” (also known as “the law of attraction”), the philosophy that maintains we materialize the reality we experience through the power of our thoughts, beliefs and intents. By employing insights that are both enlightening and entertaining, Marchant offers readers an engaging, practical look at these topics and the complementary relationship between them for explaining how our reality comes into being. For a downloadable PDF sample of Third Real, including the book’s front and back matter, its Introduction and the first three chapters, click here. For those interested in the book’s Press Kit, click here. Visit this site’s Store Page for the many purchase options available for this title’s print and ebook versions. To visit the official Third Real web site, click here. Brent Marchant’s Third Real: Conscious Creation Goes Back to the Movies entertains while providing a primer for how each of us can help to manifest a radically improved reality for all of us in these tumultuous times. This gem of a book addresses a rich panoply of psychological topics, encouraging us to recognize hidden treasures buried even amidst the murkiest emotional depths. Without sounding preachy or prescriptive, Marchant deftly guides us toward the creation of a positive new paradigm at this pivotal point in human history—sharing priceless lessons gleaned from more than 60 extraordinary films. Third Real whets our appetite to see each of the featured films with newfound appreciation for how their lessons can best be added to our conscious creation toolkit for use in our personal lives—and for the best outcome for us all. Perhaps you have witnessed the cinematic ‘burn mark,’ a trigger to the traditional film projectionist to start the next reel. 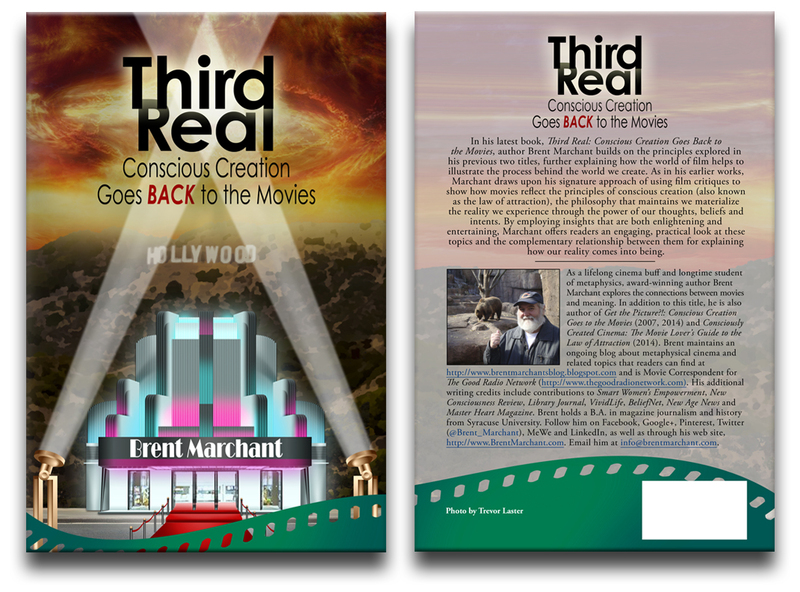 Author Brent Marchant’s latest offering, Third Real: Conscious Creation Goes Back to the Movies, is that giant, satisfying third reel that reveals enhanced principles of conscious creation. Brent uncovers new directions of consciousness, of awareness through examples in cinema that have real-world implications, shifting humanity’s future to a braver and more fulfilling existence. In his latest book, Third Real: Conscious Creation Goes Back to the Movies, author Brent Marchant states “I’m convinced that we’re truly on the verge of our own third reel/third real moment, and we’d better get busy before it escapes us and the credits start to roll.” I couldn’t agree more. As a public librarian and reader/listener/viewer advisor to a diverse customer base, I think it is more important than ever to encourage deeper thinking and broader experiences in order to understand more fully how one can redirect and affect the course of one’s own future. Marchant applies the concepts of conscious creation to over 60 movies produced over the past 30 years not previously discussed in his two earlier titles, updating his film canon of careful consideration and analysis. For readers who are unfamiliar with conscious creation and the work of Jane Roberts, the author provides a comprehensive yet neatly summarized overview in the Introduction. Each of the 11 chapters considers a collection of titles curated by theme—for example, Living in the Moment (Harold and Maude, You Can’t Take It with You, Still Alice, On My Way, Gleason)—and relates these titles to each other by overarching concept. Painstakingly researched and footnoted, Third Real: Conscious Creation Goes Back to the Movies is highly recommended for film studies, the casual moviegoer and as a viewer-advisory resource for libraries. Brent Marchant skillfully exposes hidden layers and dimensions buried in the many remarkable movies Third Real: Conscious Creation Goes Back to the Movies meticulously explores. Readers will end up watching these movies again and would undoubtedly experience and enjoy them even more. A must read for film lovers, filmmakers, film critics and everyone interested in conscious creation. Brent does a superb job of using movies to explain the essence and power of the law of attraction! This is a must read for movie lovers and those looking to create the life they’ve always dreamed of! Another gem for Brent Marchant! Third Real: Conscious Creation Goes Back to the Movies deepens the conversation about how our thoughts and beliefs impact and shape our lives. By offering several movies to illustrate each concept, Brent has developed a method of walking in another’s shoe’s and gives his readers a unique way of experiencing these rich ideas from many perspectives. My Netflix queue has just gotten much longer! Like fine wine, Brent’s books improve with each vintage. In Third Real, not only do you get insightful and in-depth movie reviews, but you receive something so unexpected, a new way of looking at movies and your life because of his wisdom and thought-provoking conscious creation interpretation. I also loved the interesting surprises, like little-known documentaries and cable specials that I may never have known about! You may have a hard time putting this book down. Saturday Night at the Movies meets the X-Men School for the Gifted! Bravo to Brent Marchant for Third Real—an informed and entertaining guide to creating our best selves while enjoying the movies that enlighten our present and future worldviews. Read the book, watch the movies, do the inner work, and have fun while you create a more conscious and happier you! Reading Brent Marchant’s third book, Third Real: Conscious Creation Goes Back to the Movies, I am reminded why I like interviewing him so much. He has a way of seeing things that we naturally miss, the in-between-the-lines, so to speak. I have seen some of the movies he talks about in this book, but now I wish to see them again because of what I have missed. Also, some movies I was not interested in I now wish to see, because he has made them intriguingly inviting. We all seek some meaning from a movie, a connection, an understanding, a reflection of self, but do we watch these movies from our inside out, of just let it wash over us? Brent has a gifted insight into the characters and the very purpose of a movie. We see what the movie is about from a place of inner comprehension and mirroring that image of inner truth back to us. I will be interviewing him on this book and look forward to speaking to some of the movies he has written about from a new perspective. We all gain when we truly see, and Brent has a gift of seeing and opening us to our conscious selves in a way that is unthreatening and refreshingly honest. Thank you, Brent, until the next show. A sold academic view of important movies (popular and obscure) from the last 30 years, a real film buff’s treat with excellent insights into what makes a movie connect with an audience. I love reading Brent’s interpretations and views of the movies I have seen, and have yet to see, in his latest book, Third Real, which helps us to understand the principles of the law of attraction and to derive the deeper, sometimes-hidden meanings behind the story lines. It makes watching (and sometimes rewatching) the movies more entertaining and yet more meaningful at the same time, allowing us to relate our own lives to the characters and journeys portrayed on film.  Part movie critic, part philosopher, Brent Marchant’s evocative reviews highlight the universal themes and spiritual lessons to be found in his great selection of films. He will inspire you to see them again with fresh eyes. It is said that fiction is where someone gets to tell the truth. 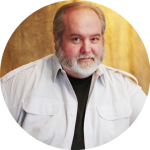 In Third Real: Conscious Creation Goes Back to the Movies, Brent Marchant shows us examples of this regarding spiritual and metaphysical realities in many of the stories that have made it to the realm of the movies. Additionally, the concept of creating your reality may seem to have originated during the introduction of the New Age movement of the ʼ70s. However, that is not the case as Brent gives examples of how that truth has made it into the stories of the movies as far back the ʼ30s. In this thought provoking and entertaining book, Marchant offers up many co-creation concepts and, for each of them, provides five different summaries of movies in which they are each incorporated, showing us how they’re reflected in everyday life. Film is transformative. As poetry can save one’s life, film, too, has the power to airlift us to a realm of exquisite rawness, renewal and resurgence. Third Real accomplishes this intricate tightrope of miracles, in opening one’s heart, emptying its contents, and encouraging the mind’s eye to both escape and sample an ocean of films that rebuild, expand our corrugated beliefs and re-evaluate our place in the Universe. Each film offers a glimpse of redemption, triumph, loss, challenges, and a universal exploration of our truth and our human connection. Brent Marchant has linked the dots in over 40 affirming films, all which capture a variety of dramatic and comedic insight that offer the promise to personify our beliefs and warm us with laughter, as well as deny and challenge our fears. From the prayer of “Awakening,” the power of “Belle,” the callousness of “Burn After Reading,” the defiance of “The Danish Girl,” and the determination to keep our eyes on the prize with “Selma,” you are bound to root for our common humanity and instinctual exploration for awe inspiring moments. Author and psychologist Edward de Bono sums this up when he writes, “A memory is what is left when something happens and does not completely unhappen.” Third Real: Conscious Creation Goes Back to the Movies is an interactive pilgrimage in such lateral thinking. Brent Marchant’s Third Real: Conscious Creation Goes Back to the Movies serves up a sequel worthy of the franchise the award-winning author has established through his two previous titles. Building on the concepts he introduced in his prior books, Brent again draws upon film as a source of inspiration for illustrating the principles of conscious creation. This time, though, he goes beyond the basics, offering readers insights into some of the finer points of the philosophy and explaining how these significant nuances can make the practice work more effectively. Grab your popcorn, and sit back for a fun, enlightening read. Award-winning author Brent Marchant takes on his responsibility in writing Third Real for alerting film goers of their responsibility for what happens in their lives by default or with awareness of the examples he cites in the suggested films he critiques. His book strongly suggests and relates the characters’ various faults and virtues so that, in the end, you can learn to put into perspective what you can do to turn your life to one of perfection, expectation and being a winner. The way in which he describes metaphysically what the characters are dealing with helps readers and film goers relate their lives to these experiences so that they can take responsibility for what transpires in their lives and how to claim their power at any juncture of their journeys. I want to thank Brent for opening the door to explore these concepts through film. But, as important as it is to apply them in our individual lives, perhaps the most significant way we can make use of them is in our collective efforts. As Brent so prophetically observes in these pages, “As I noted in this book’s Introduction, our third reel/third real moment is when we get down to brass tacks. So let’s go for it—and manifest a reality truly worth living for.” And, in my opinion, there you have the true message of this book—manifesting a REALITY worth LIVING for! Noted self-help author Napoleon Hill coined the phrase, “If we can conceive it, we can achieve it.” Now that we have conceived of the idea of drawing upon the art of film to allow us to influence the mass collective and consciously create the means to save our planet, isn’t this a concept worth exploring? In pursuing that goal, let Brent help be your guide. Thank you, Brent, for giving us such a thoughtful book to help us achieve this ambitious and worthy aim. Indeed, if we follow the lead provided here, there’s no telling what we might achieve.